There are multiple web entries that touch this, but a comprehensive out-of-the-box setup of MongoDB shard is nowhere to be found. First of all, some of available materials are old and no longer applicable to the latest (4.0.1) MongoDB version. There is also the case of setup and configuration complexity. Docker - tested on "Docker for Windows" and Docker on Ubuntu host. 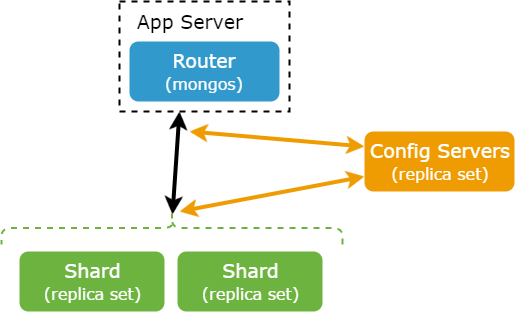 standard mongo image pulled from DockerHub. The end result is 2 shards (each replicated, with single mongos router and replicated config servers). The first step is to create 2 replicaSets for future shards. In this case, the first and second replicas are replica sets of 3 nodes. This is done by --replSet rs1 switch in the command line. Additional --shardsvr switch is for future sharding. Each starts with --port switch - because the default port is surprisingly 27018. After we init the first replicaSet of 3 nodes (rs1), the second replicaSet -(rs2) needs to be initiated the same way with other hosts set. The next step is to create a config server. This server will store information about sharding status across all parts. To do this you need to add --configsvr switch. This is a standard replica setup, except for configsvr: true, part. Without this, shard will not work. Another difference is that we need to remember is that config servers will not be added as shards - thats why we don't add --shardsvr. In this case it is a replica set of 3 nodes. This is done by --replSet cnf-serv switch in the command line. Each starts with --port switch - because default port is 27019 surprisingly. All 3 nodes need to be started this way. Then configure and start your replication. To do this, you need to connect to any node and run the following commands on mongo. The switch parameter --configdb is a connection url for replicaSet of config database. Last step is to add each shards. To do that, we need to connect to mongos router and add them. This command will show shard status. Code for this tutorial you can find on GitHub https://github.com/senssei/mongo-cluster-docker run with Docker Compose. 23.08.2018 Updated with latest MongoDB v4.0.1.